The ULS Design Functions spreadsheet has been updated with the addition of provision for the Eurocode 2 rectangular stress block. The new spreadsheet can be downloaded from: ULS Design Functions.zip (including full open-source code). 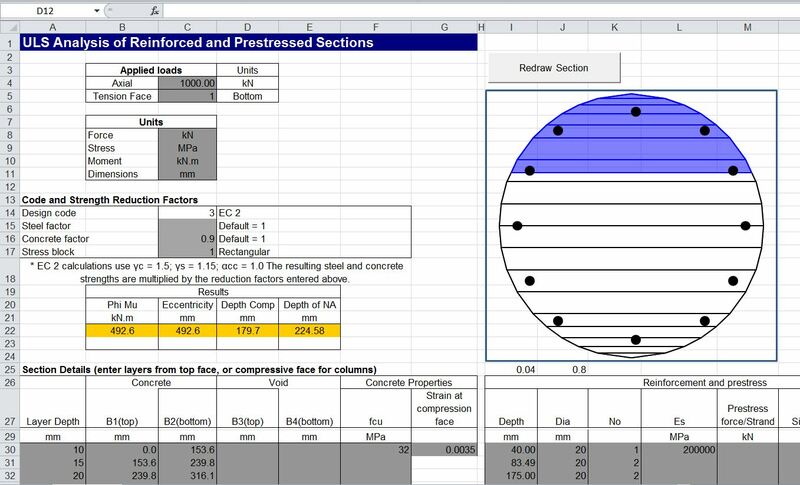 This entry was posted in Concrete, Excel, Newton, UDFs, VBA and tagged Concrete section, Excel, Prestressed concrete, Reinforced Concrete, UDF, ULS design, VBA. Bookmark the permalink. im just curious why interaction diagram is going crazy in max. normal force nearby area, when non-symetrical reinforcment is defined? I’ll have a look. I did have some problems with the circular section giving one point on the interaction diagram being way off with the Eurocode, but not the other codes. I thought I had that fixed, but evidently not. Thanks for the feedback, and please let me know if you find any more problems. you’re welcome, what have been changed? Thanks for letting me know about this problem (and the other ones). Looking at the revisions, it looks like the fix in 2013 didn’t work when the heavier reinforcement is in compression. There no calculation for max. pure tension (as max. pure compression)? (I even can’t imagine when calculation for tension is needed so it is just for beautiful picture and not so important).